Sea to Sky Park Services Ltd. 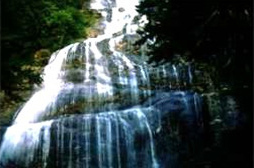 Located east of Chilliwack, Bridal Veil Falls Provincial Park is a scenic day-use area. The landscape encompassing the park is characterized by low elevation valleys and lush, rounded mountains. Visitors can enjoy picnicking, hiking, and viewing the spectacular Bridal Veil Falls, which tumbles 60 metres over a smooth rock face, creating a “veil-like” effect. Bridal Veil Falls is prone to freezing during colder winters, which results in the formation of an unstable wall of ice. During these periods, the base of the falls is an extremely hazardous area. Please use caution at the base of the falls as it may be subject to slippery footing and falling rock or ice. History: Prior to the park attaining Provincial Park status in 1965, Bridal Veil Falls was used to generate electricity in the early 1900s for the Bridal Falls Chalet. Today, only traces of the concrete foundation for the power generator can be found. Cultural Heritage: Bridal Veil Falls Provincial Park is located at the site of the ancient village of Popkum which has settlement records dating back to the 1700s. Popkum is a First Nations word meaning “puff ball”, a plant which grows in the area in abundance. Conservation: The park is situated in the Coastal Western Hemlock biogeoclimatic zone. Western red cedar, western hemlock, broadleaf maple, and red alder form a dense canopy over a sparse understory of western sword fern and spiny wood ferns. Wildlife: The significant wildlife species in the park are primarily songbirds and small mammals. Songbird species include the varied thrush, black-throated gray warbler, and red-breasted nuthatch. Transient species include porcupine, Columbia blacktail deer, and black bear. There is a one loop trail that will take you to the viewing platform near the base of the falls (½ hour return). For your own safety and the preservation of the park, obey posted signs and keep to designated trails. Shortcutting trails destroys plant life and soil structure. There is a viewing platform at the base of Bridal Veil Falls. Cold water taps are located in the day-use area. Taps are shut off during the off-season. This park has a day-use/picnic area. There are no public shelters available. The Park is closed during the winter due to hazardous conditions and the gate is closed and locked from approximately mid-October thru early-April.